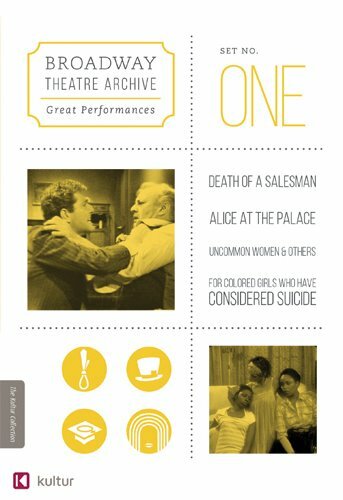 This first set of Broadway Theatre Archives Great Performances includes the superb 1966 television adaptation by Arthur Miller of his Pulitzer Prize-winning modern tragedy, Death of a Salesman, starring the incomparable Lee J. Cobb and Mildred Dunnock re-creating their original Broadway roles as the Lomans. Oscar-winner Meryl Streep stars in Alice at the Palace, this delightful 'music hall' version of Lewis Carroll's Alice in Wonderland and Through the Looking Glass. with all of the beloved characters - from the Mad Hatter and the Cheshire Cat to the Queen of Hearts - given a unique twist by the witty and charming performances of an accomplished theatrical ensemble. In Uncommon Women, Oscar winner Meryl Streep, Swoosie Kurtz, and Jill Eikenberry star as former classmates at a reunion seven years after their graduation from Mount Holyoke College, who assess whether they have achieved their youthful goals. For Colored Girls Who Have Considered Suicide stars Oscar nominee and Emmy-winner Alfre Woodard and Lynn Whitfield as they celebrate in song, poetry and dance their strength, beauty and enormous capacity for love. If you have any questions about this product by Kultur, contact us by completing and submitting the form below. If you are looking for a specif part number, please include it with your message.